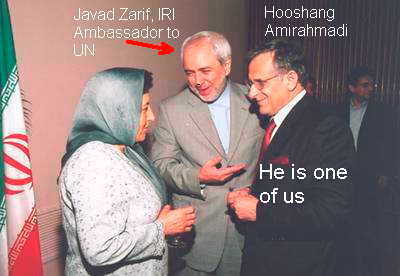 Are Iranian regime sympathizers influencing the Iraq Study Group? Are Iranian regime sympathizers using the members of the Iraq Study Group as tools to promote an Iranian agenda? We must publicize this by putting enough pressure on the Baker Iraq Study Group to reveal the names of all of their so-called Iranian-experts. Trust me, there are many Iranian activists who know much more about such Iranian characters than many Americans do and we are here to help. Unless, America clearly knows who, among the so-called “Iranian experts”, has influenced the Baker Commission, I have no doubt that she will be making her greatest mistake to accept ISG’s recommendations. Baker Commission must announce the names of Iranians who have helped/influenced ISG’s recommendations. America needs to also trust her ordinary loyal Iranian-American citizens who have a better understanding about the so-called “Iranian-experts” and tell America which one is an Iranian regime sympathizer. Amirahmadi believes that there is no reason for his disqualification, because he is a patriotic Iranian and he has never acted against the Islamic Republic and he has never been a member of any group or faction. Do you know that these forces [opposition] are those who want nothing except toppling of the regime? Opposition groups who do nothing for the nation but nagging, but for toppling the regime, they will work with America, Israel, Arabs and any forces that they could use them as tool. Since they view foreign powers as tools, they in turn become tools. These forces [opposition] have almost used all the necessary tools to reach their goal and now their only hope is America and Bush’s government. In situations when the government [IRI] didn’t know which way to choose and when they would seek the deceased Ayatollah Khomeini’s advice, he always had one answer and that was: “the measure is the people’s vote.” This is a beautiful statement, populous, humane and Islamic. If Mr. Amirahmadi is indeed working with the Iraq Study Group, one must ask: will he use them as tools? He did not need to brownnose the Islamic regime in Aftab News or Baztab News; no one could ever mistake him with an opposition member to Islamic Regime. With pictures (such as those posted here), where he is with Javad Zarif and Mullah Kahrubi, he can not possibly qualify to be an honorable opposition member. Has Iran Infiltrated the Baker “Iraq Study Group”?